Smartgeometry (SG) is a key influence on the architectural community who explore creative computational methods for the design of buildings. An informal international network of practitioners and researchers, the group meets annually to experiment with new technologies and collaborate to develop digital design techniques. When SG was founded in 2001 by London-based architects and friends Hugh Whitehead (Foster + Partners), J Parrish (AECOM) and Lars Hesselgren (PLP), there was little in the way of parametric tools for architecture. SG was founded to encourage the development, discussion and experimentation of digital design techniques driven by design intent rather than on construction specifications. SG calls for a re-consideration of the design process, where the creation of computational mechanisms become an integral part of designing – not a task done prior to or separate from the process. In the early years of the workshops this need for new ways of design thinking led to the development of Bentley´s GenerativeComponents software. In recent years, the ecology of these design environments has diversified to include multiple software platforms, as well as innovative fabrication techniques and interactive environments. SG has grown accordingly from a handful of experts to an international network of designers who are defining the future of design. Founded by digital pioneers, it creates the algorithmic designers of the future. Inside Smartgeometry can be seen as a retroactive manifesto for SG, examining and contextualising the work of the SG community: the digital spaces, prototypes and buildings designed using bespoke tools created in response to architectural ideas. From interactive crowd-sourcing tools to responsive agent-based systems to complex digitally fabricated structures, it explores more than a decade of advances that have been influential for architecture. 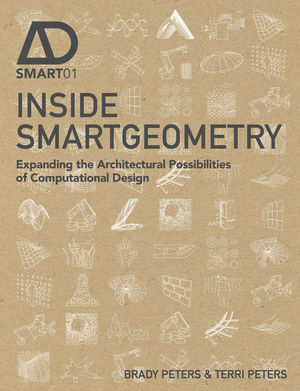 Through 23 original texts including reflections by the founders, and key contributors such as Robert Aish, Martin Bechthold, Mark Burry, Chris Williams and Robert Woodbury, the book offers a critical state of the art of computational design for architecture. Many international design and engineering firms have participated in SG and the book includes chapters by practitioners from offices such as CASE, Design2Production, Foster + Partners, Grimshaw, Populous and SOM. Brady Peters is an architect. A PhD fellow at the Centre for Information Technology and Architecture (CITA) in Denmark he was previously an Associate Partner at Foster + Partners and a key member of the Specialist Modelling Group. He has taught at the Royal Danish Academy of Fine Arts, the University of Ghent, the University of Nottingham, and has been a tutor at all Smartgeometry conferences since 2005. He is the co-editor with Xavier De Kestelier of Computation Works: The Building of Algorithmic Thought, Architectural Design (AD) (March/April 2013). Terri Peters is an architect, and writer. A PhD Fellow at the Aarhus School of Architecture in Denmark she researches architectural approaches to sustainable building transformation. Since 2003, she has written more than 200 published articles spanning architecture, sustainability, art, urbanism, technology and culture. She lectures internationally and sits on the jury of various design award panels and competitions. She is the editor of Experimental Green Strategies: Redefining Ecological Design Research, Architectural Design (AD) (November/December 2011).